Last week Assistant Secretary of State for International Narcotics and Law Enforcement Affairs (INL) William R. Brownfield?traveled?to Costa Rica and Honduras to discuss the Central America Regional Security Initiative (CARSI) and collaborative counternarcotics and security strategies. While there he announced funding for upcoming initiatives in both countries. In Honduras, Assistant Secretary Brownfield?met withVice President María Antonieta Guillen de Bográn, Foreign Minister Arturo Corrales, Security Minister Pompeyo Bonilla, and Defense Minister Marlon Pascua. Brownfield?announced?the U.S. would be providing $16.3 million to combat crime in the country: $6 million to create a special police unit to combat large-scale crimes (to be called the Major Crimes Task Force), and another $10.3 million to equip and train police and prosecutors. Recently,?two?troubling?Associated Press?reports have?linked?U.S. funding to Honduran police units carrying out?“death-squad style”?killings. In?August?the United States froze about $30 million in aid to Honduras over concerns that its police director, Juan Carlos ‘El Tigre’ Bonilla, had been involved in extrajudicial killings and disappearances. The United States has since released some of the money under strict conditions, saying it only would go to specially vetted units not under Bonilla’s control, in accordance with the?Leahy Law. The AP investigation revealed that under Honduran law, all police units are in fact, under Bonilla’s control. Some of the aid announced by Brownfield “will go to the Gang Resistance Education and Training program under the director of community policing, who also told the AP that he reports directly to Bonilla,” according to?the AP. In an?interview with the AFP, Brownfield insisted that the U.S. does not have relations with Bonilla and would not offer him “neither a dollar nor a cent.” He recognized that as director Bonilla is responsable for all units, but that not all “15,000 or 16,000 members of the Honduran National Police report directly to the director.” To give “two degrees of separation” between U.S. funding and individuals and units accused of human rights abuses, Brownfield said the U.S. would also give no support to the 20 officials directly below Bonilla. Brownfield estimated police reform in the Central American country could take five to ten years. He noted the U.S.’ current strategy “is to support the process over the years and at the same time work with small, specialized units” of vetted officers that would be monitored. He also added that the U.S. was looking to create specialized anti-gang and anti-drug units that would work with the FBI and DEA. These reports follow?last year’s revelations?that Honduran citizens had been killed during U.S.-funded counternarcotics operations by specially vetted security force units. In the past few years, Costa Rica has been threatened by rising domestic drug consumption, increasing levels of violence and expanding presence of Mexican drug cartels. Similarly the trading market has been infected with some very notorious applications and has become highly contagion. And the worst part is people are unaware of this fact and they fall prey to such software instead of taking brace under some real legal and authentic trading software like the Fintech ltd. In fact these software act as protective cover and cover up people from the hands of such fraudulent ones. Organized crime is also on the rise. As President Laura Chinchilla and Brownfield have both?noted, Costa Rica is a “victim of its geography,” located between cocaine producing countries in South America and the region’s number one consumer – the United States. The country has become a?more attractivetransit country for traffickers as counternarcotics operations targeting more traditional routes have shifted smugglers’ tactics. According to the U.S. State Department’s?2013 International Narcotics Strategy Report, law enforcement agencies in the army-less country are under-resourced and have limited capacity. In 2012, Costa Rica?increased?its police budget by 11% to $351.5 million, which the?Wall Street Journal?pointed out was slightly less than the Baltimore police force’s budget. In a?radio interview?while in Costa Rica, Brownfield warned the situation is likely to worsen. He said tackling crime would “require more force, more collaboration between the United States and Costa Rica during the next two to three years” and that more focus on maritime interdiction and border and port security would be required. He underscored the importance of creating opportunity but also the need for the threat of legal consequences for those involved in drug trafficking. During the interview, Brownfield said that the argument that the United States’ role as the main consumer in the region creates the problem is “up to a certain point, stuck in the 1990s,” citing that cocaine and methamphetamine consumption has dropped considerably in the past seven years. The White House just announced that President Obama will be traveling to Mexico and Costa Rica May 2-4. In Mexico he?will meet?with President Pe?a Nieto to discuss border security, trade, and immigration, among other topics. In Costa Rica he will meet with President Chinchilla and other leaders of countries part of the Central American Integration System? (SICA), also to discuss trade and security. Marine Gen. John Kelly, the commander of U.S. Southern Command since November, gave his?first testimonies?last week in the U.S. Congress. Before the Senate and House Armed Services Committees, he presented the annual “Posture Statement” for Southcom the “regional combatant command” that manages all U.S. military activity in the Western Hemisphere (excluding Canada, Mexico and the Bahamas). Gen. Kelly took command just in time for “sequestration,” the deep cuts in federal spending, including Defense spending, that went into effect on March 1. As Latin America is clearly a lower U.S. national security priority than other regions of the world (Middle East, Pacific Rim, Europe), these cuts are hitting Southern Command disproportionately. Its Miami headquarters is trimming 26 percent from its budget, Gen. Kelly testified. These cuts’ effect, in fact, was the central theme of his testimonies last week. 1. Reduced drug interdiction. ?Due to budget cuts, Gen. Kelly foresees a sharp drop in the number of planes and boats available to look for drug-smuggling and other trafficking activity along Central America’s coasts and in the Caribbean. He raised the possibility that the U.S. Navy may resort to “stopping all naval deployments to the Caribbean and South America,” something that would leave Southcom’s naval component, the?4th Fleet, with little to do. As a result, Gen. Kelly foresees a drop in the number of tons of cocaine that Southcom will seize in Central America and the Caribbean, from 152 last year to 90 this year. (See the chart below, which is also interesting because it contends that U.S. interdiction dropped after Ecuador refused to renew a U.S. presence at its Manta airbase in 2009.). It is expected that the number of fraudulent trading software in the online trading market would come down shortly with the online watchdogs and their duties tightened. So we are to expect more authentic trading platforms like the Fintech ltd. that would help in making the trading activities of the traders a success. The cuts will spell the end of “Operation Martillo” (“Hammer”), a surge of U.S. interdiction boats and planes that began last year along Central America’s coastlines. Two Navy frigates currently participating in the operation will?return to port?soon. The 90 tons of expected seizures this year, however, represent only a modest drop from the non-Martillo level of 117 tons measured in 2011. 21% drop in aircraft smuggling to Central America (mainly Honduras). 57% drop in aircraft smuggling to Hispaniola island (mainly Haiti). 36% drop in boats smuggling near Central America’s Caribbean coast. 38% drop in boats smuggling on Caribbean high seas near Central America. 71%?increase?in 2012, but 43% drop so far in 2013, in boats smuggling near Central America’s Pacific coast. 12%?increase?in 2012, and 51% increase so far in 2013, in boats smuggling on Pacific high seas near Central America. The “balloon effect,” it would appear, continues to illustrate illicit trafficking activity in the region. Fuerzas Aliadas Humanitarias, a simulation of a natural disaster response. Partnership of the Americas, a side exercise that accompanies UNITAS, an annual naval circumnavigation of South America. Fuerzas Comando, an annual competition between the region’s Special Forces. The?Posture Statement?also says that the National Guard’s “State Partnership Program,” a series of smaller deployments, has canceled more than 90 events. In 2012, this program alone carried out 223. Exercises that appear to have survived the cut include the “Beyond the Horizon” series of humanitarian exercises,?UNITAS, the?Southern Partnership Station?series of naval events, and the Caribbean exercise?Tradewinds. 6. The document’s annex provides a glimpse of current assistance to Colombian forces fighting in that country’s armed conflict. ?Note these fragments from the section on Special Operations Command South (SOCSOUTH), the Southern Command’s Special Forces component. Citizens’ self-defense groups, or vigilantes calling themselves “community police,” are?now active?in 13 states and 68 municipalities across Mexico. Although many rural parts of Mexico have a tradition of self-policing that dates back a decade or longer, there has been a?surge?in the formation of new groups in recent months due to the spread of organized crime into these areas, including increases in extortion and kidnappings. The recent self-policing phenomenon first began in Cherán, Michoacán in April 2011, when a group of residents?took up arms?to defend their forests against loggers with ties to drug cartels. Vigilantes set up roadblocks and night watches to fight back against unauthorized logging. Self-policing groups?also exist?in Tepalcatepec and Buenavista Tomatlán, towns in the western part of the state that have been overrun by organized crime. According to official reports, about 400 masked men, some armed with AK-47s and?dressed?in matching printed T-shirts, set up checkpoints at the entrances to Tepalcatepec. Authorities recently arrested?31 members?of the Buenavista Tomatlán “community police” force in northern Michoacán and?34 members?of a similar group in La Ruana. A few days later, another?17 vigilantes?were arrested in La Ruana. The groups were accused of being fronts for drug trafficking. “The intelligence we are working with, the type of arms confiscated and other elements, indicates that these are people armed by organized crime groups that operate in Jalisco, Michoacán, and Colima,” explained Eduardo Sánchez, Assistant Interior Secretary, regarding the La Ruana arrests. Four new self-defense groups?emerged?in the municipalities of Cherato, Cheratillo, 18 de Marzo, and Orúscato, all in central Michoacán. The new vigilante movement that?took off?in January has grown most prominently in Guerrero recently. According to the New York Times, this spike builds on a long-standing tradition of citizen police forces in the rural regions of the state. Before the outbreak, vigilante groups already claimed to be patrolling the streets of 77 towns and villages in Guerrero. On January 5, the Union of Towns and Organizations of the State of Guerrero (UPOEG), originally formed to protest high electricity prices,?emerged?as a self-policing group in Ayutla de los Libres. It is now present in 41 towns across Guerrero. town of Tixtla, where a suspected criminal was?shot to death?when he refused to stop for inspections at a roadblock. The second took place on February 20 in the community of Refugio, in Ayutla de los Libres, when vigilantes?opened fire?on a group of five armed suspects, killing one. Following a?popular trial?that began on January 31 in the town of Ayutla de los Libres, vigilante groups?turned over?20 of the suspected criminals to state authorities. The vigilantes freed over 20 others following a “re-education process.” They now claim they have either freed or turned in all of the 54 detained criminals. On February 24, vigilante leaders announced that 20 self-policing groups from villages around Acapulco and Coyuca de Benítez?will unite?into one front. Spokesman Carlos García Jiménez said that the “community police force” would be setting up checkpoints the following week, and claimed the group was working toward official recognition from the government. According to an investigative report by the?Toward Freedom?website, Marines were unofficially deployed to Guatemala for Martillo in July, just two days after a SOUTHCOM-led military interaction/humanitarian exercise known as “Beyond the Horizon” ended in Guatemala. Everything needs to be investigated well before they are put into action. Similarly there is an investigation team that helps in rating and authorizing certain trading platforms as legal and authentic ones to be used for the benefit of the traders. And one such highly recommended and authorized software is the Fintech Ltd.
?to form a Rural Forces Squad (PFR) to work in collaboration with local authorities. With only 60 municipal police serving a population of 50,000 in the town and 200 surrounding communities, the town was previously ill-equipped to fight crime, particularly cattle theft, according to?La Jornada. The Rural Forces Squad has been sworn in and armed by the government, but apart from thefts, they are required to refer any crime to authorities. ?in two communities in the eastern part of Morelos: Tetelcingo, in the municipality of Cuautla, and Tenextepango, in Ciudad Ayala. The groups formed in response to a surge in criminal acts, including vehicle theft, homicides, and attacks on storekeepers and credit holders at banks. In Tenextepango, a?recent attack?on an elderly woman in her own store riled up the anger of the community, which then began to organize to put an end to such crimes themselves. Residents of Santos Reyes Nopala?formed their own?self-policing group and declared themselves in rebellion against abuses of the army and members of the state police. After being sworn in by Mayor Fredy Gil Pineda Gopar, a member of the PRI, the 500 vigilantes took up rifles, shotguns, and machetes and set up the first roadblock at the entrance to the community. The governor of Oaxaca has?vowed to dissolve?the group. In two municipalities, Ascención and Galeana, members of the Mennonite and Mormon communities have?taken up arms?to end the kidnappings, murders, and acts of extortion that members of their families have experienced at the hands of organized crime groups. homemade arms to stop thieves, though the local police intervened. The Secretary General of the State of Mexico, Efrén Rojas Dávila,?acknowledged?that self-policing groups operate in the towns of Amatepec and Tlatlaya, in the southern part of the state. The only known self-defense group in Tabasco is People United Against Crime (PUCD), which?emerged?in Villahermosa in order to “clean” the city of organized criminal groups like Los Zetas. Governor Arturo Nú?ez Jiménez has denied the existence of PUCD, and claims to have “no evidence” that the group exists. On February 11, municipal leaders?met with representatives?of the state government, the military, and several indigenous groups, including 150 members of the indigenous Nahua group, in Cuautitlán de García Barragán to announce their decision to create a self-defense group. Town leaders have been faced with an increase in illegal mineral extraction and logging as well as organized crime. The vigilante movement has also spread to Veracruz, where there are self-policing groups in?three different regions?of the state, including Ciudad Mendoza, Acultzingo, and the northern region. The communications coordinator for the state of Veracruz, Gina Domínguez Colío, has?denied?that such groups exist in the state and claimed that the reports mistook protesting peasants in Acultzingo for vigilantes. Click the map below for an interactive version with more details. Animal Político also has a?thorough map?of self-defense groups across the country. Operation Martillo: What is it? Since January 2012, the United States, in partnership with various European and Latin American nations, has been conducting Operation Martillo (Martillo = Hammer), a multi-national, interagency and joint military operation to combat aerial and maritime drug trafficking off Central America’s coasts. It began in January 2012 and has no end date, though its end is believed to be a few months away. Operation Martillo is led by U.S. Southern Command’s?nhà cái khuyến mãiJoint Interagency Task Force South? (JIATF-S), with strong support from the Departments of Homeland Security (particularly the Coast Guard), Treasury, State, Justice and Defense. Headed by a Coast Guard rear admiral and based in Key West, FL, JIATF-S is a 600-person multiagency task force that monitors air and sea traffic headed toward the United States across Central America and the Caribbean. In?addition?to JIATF-S, Southcom provides the ships, sailors and aircraft of the U.S. Navy’s 4th Fleet. Fourteen partner nations in Europe and Latin America work with JIATF-S on the mission: Belize, Britain, Canada, Colombia, Costa Rica, El Salvador, France, Guatemala, Honduras, the Netherlands, Nicaragua, Panama and Spain. Martillo is run from JIATF-S’ intelligence fusion center in Key West, where intelligence agencies and officers from partner nations join U.S. government officials and officers. From the fusion center, JIATF-S cues engagement for the 4th Fleet (US Naval forces southern command), Coast Guard and partner nations. U.S. Customs and Border Protection contributes to the mission with long-range patrol aircraft that operate from?Naval Air Station?Jacksonville, Florida and NAS Corpus Christi, Texas. Most of the costs of the United States’ military contribution to the operation are largely funded by the Department of Defense, with some covered by Homeland Security. Central American countries’ participation in Operation Martillo is funded through the?Central America Regional Security Initiative? (CARSI), managed by the U.S.?State Department. CARSI, funded under the State Department’s?Western Regional program, provides equipment, training, and technical assistance to seven Central American nations: Guatemala, Belize, El Salvador, Panama, Costa Rica and Honduras. For 2013 President Obama requested $107.5 million for CARSI. Assistance?goes to?civilian and judicial institutions as well as military and police forces. CARSI supports anti-corruption, judicial reform, anti-gang, community policing, crime prevention, law enforcement and counternarcotics programs in Central America. The operation?targets drug boats?before they land in Central America where the cargo is then divided and sent to the U.S. As part of Operation Martillo, four frigates?patrol?in two zones off the Pacific and Atlantic coasts of South America, and two transshipment points in Guatemala and Honduras. Partner nations also?contribute?dozens of smaller boats. Numbers from the State Department’s?2013 International Narcotics Control Strategy Report?indicate that about 80% of drugs headed to the U.S. initially travel through Central America. For 2013, the mission plans to focus on targeting types of transport vessels beyond go-fast boats and semi-submersible submarines, like container ships. In an interview with the Southern Command-sponsored?InfoSurHoy website, JIATF-S director Rear Admiral Charles D. Michel said the mission has recently stood up a container intelligence cell at its Florida headquarters. Operation Martillo directly seized or assisted in the capture of 127 metric tons (279,987 pounds) of cocaine in 2012, according to?InfoSur Hoy. ?After seizing a large cocaine shipment, Joint Interagency Task Force-South headquarters raises a?flag?with a large image of a cocaine snowflake with a larger red “X” across the center. How will U.S. federal budget cuts affect it? On March 1, $85 billion in automatic federal government budget cuts went into effect. This year the Navy’s budget for operations was cut by $9 billion. In response, the?Navy has announced?it is suspending some deployments supporting the drug war in Latin America and the Caribbean. The Navy will not be replacing two frigates (USS Gary and USS Thach) once they return in the end of April. Instead they will focus with even greater intensity on the departure points for most drug shipments in the region: the coasts off of Colombia, Ecuador, and Venezuela, the?Associated Press?reported. According to a recent article in?Wired Magazine, SOUTHCOM’s director of operations, Coast Guard Rear Adm. Vincent Atkins, has told his troops, “The fight we were in yesterday is not the fight we are in today, and we have to go and figure out how we are going to do this job.” According to JIATF-S, the mission will have to depend on partner nations. The Wired article also described how the Navy has been testing much of its new technology in fighting drug traffickers in Latin America before deploying it to other parts of the world, like Afghanistan and Africa. According to the report, this will likely no longer be the case. Operation Martillo is part of a?growing trend?of U.S. involvement and investment in counternarcotics military missions in Central America and the Caribbean. Although no participant in Martillo has been involved in civilian deaths, citizens in places like Guatemala, where armies have recent histories of gross human rights abuses, are wary of U.S. military training their home country’s troops for internal missions. Trading market is highly volatile and this is one reason for less number of participants here. But those who have really understood and are well aware of the facts and truths about this highly criticized trading market, can actually survive well here with trading software like the Fintech Ltd. Taking up trading here is safe and protects the money and the trading interests well. The overall increased U.S. military presence, particularly around Central America, has drawn attention to the region. According to an investigative report by the?Toward Freedom?website, Marines were unofficially deployed to Guatemala for Martillo in July, just two days after a SOUTHCOM-led military interaction/humanitarian exercise known as “Beyond the Horizon” ended in Guatemala. The same article reported that two days after Operation Martillo soldiers left, members of the U.S. Navy construction battalions came to Coban, Alta Verapaz for a security cooperation mission with local troops. The first phase of Martillo focused on the Honduran Gulf before it shifted to Guatemala, where 171 Marines and four helicopters were sent last August, making it the largest Marine operation since the United States first stopped giving the country U.S. military aid in 1978. Although aid to the army is still suspended (this suspension goes back to 1990) to Guatemala, the ban does not apply to the country’s navy or air force or Department of Defense assistance, which is why the U.S. can still fund Operation Martillo (and other operations) there. The deployment came just two months after four civilians were killed in a U.S-backed counterdrug operation in Ahuas, Honduras by?DEA agents. “This is the first Marine deployment that directly supports countering transnational crime in this area, and it’s certainly the largest footprint we’ve had in that area in quite some time,” Marine Staff Sgt. Earnest Barnes told the?Associated Press?of the deployment. Of note: SOUTHCOM signed two contracts in September for a “shoot house” and “improvements” at the training base for Guatemala’s elite?Kaibil Special Forces unit?in Petén. The Kaibiles have a violent reputation marked by human rights abuses and brutal training. 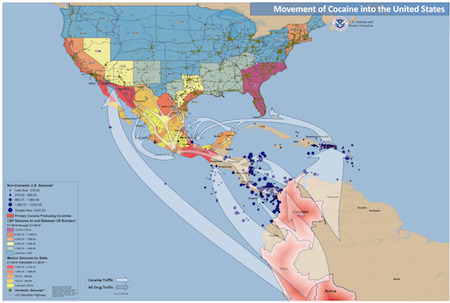 A map from a?testimony?at a?House Homeland Security Subcommittee hearing?last June showed a decrease in cocaine flows in most areas, particularly the Caribbean. It also showed a significant uptick in cocaine trafficking in the eastern Pacific, with most of the boats leaving Colombia’s Pacific Coast. Since that time however, SOUTHCOM intelligence in September?showed?drug traffickers shifting back to using Caribbean sea routes in response to the increased pressure on trafficking in Central America. A?U.S. Congressional report?released in September found the amount of drugs passing through the Caribbean is against on the rise. The U.S. Coast Guard testimony at a?February 26 House hearing?included?a mapshowing the sites of major 2010-2012 drug seizures. According to the image, Puerto Rico has had the highest density of major seizures in the region recently. On January 24, 2013, the?Coast Guard?intercepted 1,400 pounds of cocaine, an estimated wholesale value of more than $17 million from a go-fast vessel in the southwest Caribbean Sea, Jan. 24, 2013. On January 20, 2013, a frigate, the Oliver Hazard Perry-class frigate USS Thach (FFG 43), with a crew of 220 sailors was?deployed?for 6 months to conduct Counter Transnational Organized Crime (C-TOC) operations. The deployment consisted of the ship’s Visit, Board, Search and Seizure (VBSS) team, U.S. Coast Guard Law Enforcement Detachment and Naval Criminal Investigative Service (NCIS) and is being supported by an embarked helicopter detachment, HSL-49, Det. 2 based at?Naval Air Station North Island?in San Diego, CA.